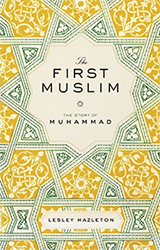 the website for The First Muslim. And how can I resist posting this elegant cover…? My IT guru and I will be refining it over the next few months, adding more content and some cool bits and bobbles. Meanwhile, would love your reactions/suggestions/comments. The cover is beautiful! 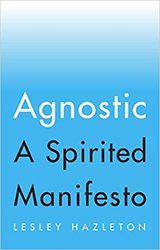 When will this book be available for pre-order on Amazon? Thanks. It’s already available for pre-order. 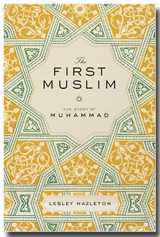 Just click on PRE-ORDER on the left-hand side of the home page at http://www.TheFirstMuslim.com. The cover is nice. Some green color which is traditionally associated with Islam. And the star type motif, very pretty and at first sight appears to be a combination of the Muslim 5 pointed and Jewish 6 pointed stars. I am glad you did not put any Arabic words on it. It has my vote. Glad you like it. It’s a traditional Islamic knot or ‘girih’ design, and intensely mathematical. Congatulations, I am so much looking forward to reading this book. The cover is beautiful! Captures the essence of Islamic representation very well. Also, think the title is genius! Thank goodness you were working on this book, just couldn’t be more timely. Thank you Lesly for writing this book. 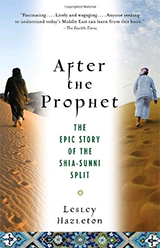 I can hardly wait to start reading, what I believe will be, one of the most objective and interesting stories about messenger Mohamed. Tried to pre-order from iTunes Malaysia. Sadly not available. So sorry — I have no idea why iTunes should be country-specific. Thbbft! Will ask my publishers. — L.